Beat the heat with some cool new releases coming in summer 2017! July brings a new look to the land of Oz, and a horde of zombie-themed releases to satisfy any appetite . . . for brains! Backstab your way to the Emerald City! Resurrect Munchkin Zombies with new cards and pawns! Shuffle and shamble your way to victory with 112 more cards for Munchkin Zombies. Wield your Trained Attack Flies and your Prehensile Tongue against the Zombie Gamer! Be the Rankest of the Rank and use the Power of SCIENCE against the dread Survivalist. Gain a new power - Hungry - and play a new Mojo, the horrible Patchwork Zombie! In addition to cards, enhance your game with the included brain-hungry pawns! 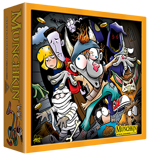 This is an expansion for Munchkin Zombies (or Munchkin Zombies Guest Artist Edition!). It is not a stand-alone game. Get a horde of dice and add-ons, all in one box! Eat brains. Don't get shotgunned. Now with more brainy goodness! You are a zombie. You want brains - more brains than any of your zombie buddies. 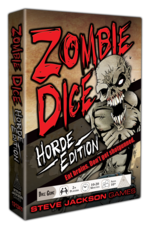 Zombie Dice is a quick and easy game for gamers and non-gamers alike. Great for large groups. The 13 custom dice represent victims. Push your luck to eat their brains, but stop rolling before the shotgun blasts end your turn! 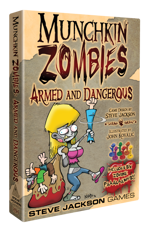 Get even more brain-hungry fun with Zombie Dice 2 – Double Feature and Zombie Dice 3 – School Bus, all in one place! Plus you get a new cloth bag and scorepad to keep track of those tasty brains. A veritable tomb's worth of Munchkin card storage! It's scary how well this monster-sized box can hold all your Munchkin loot – yet the box art by Len Peralta is somehow even scarier! This Munchkin Halloween Monster Box features zombie-Spyke amid a host of characters drawn directly from Halloween-themed Munchkin card sets. So store your stuff and show off your love of all things Munchkin with this spooky container! 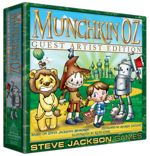 It holds more than 2,000 Munchkin cards, as well as other swag like some Dungeons and Seals and a Level Playing Field. Bonus: The Munchkin Halloween Monster Box includes 12 holiday-themed Munchkin cards that shuffle into any game!